The Condamine Alliance is working with Nature Refuge landowners to teach best practice environmental monitoring using the ALA’s BioCollect tool. The Condamine Alliance is a not-for-profit charity working with communities in the Condamine catchment in Queensland (one of the largest catchments in the Murray-Darling Basin including the towns of Chinchilla, Warwick, Toowoomba and Dalby). They work with communities to encourage best practice in biodiversity management to protect water, land and wildlife for future generations. A nature refuge is an area of land voluntarily protected for conservation, while allowing compatible and sustainable land uses to continue. A nature refuge is negotiated through a legally binding, perpetual agreement between the landholder and the Queensland State Government. Throughout 2018, Natasha Mylonas and Riley Rocco, Project Officers with the Condamine Alliance, are running a series of workshops with Nature Refuge landowners and community groups using the ALA’s BioCollect data collection platform. BioCollect is the ALA’s field data capture tool supporting ad-hoc field data recording and monitoring and structured surveys. It can support the upload of data files, field guides and user notes, images, sound bytes, videos and more. Visit biocollect@ala.org.au for more information. 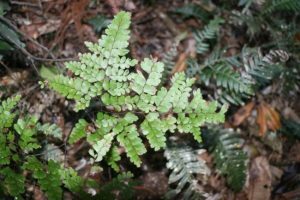 Adiantum formosum (Giant Maidenhair) recorded during an environmental monitoring workshop with the Condamine Alliance team. Two training workshops were conducted in Allora and Killarney in May 2018, followed by three more in June in Bell, Highfields and Toowoomba. We spoke with Natasha about the workshops and what participants can expect. “Our aim is to encourage landowners across Queensland to look at and record the biodiversity on their properties – this includes native plant and animals as well as pests and weeds. The more information we have, the more we can provide support to protect and conserve our natural environments,” Natasha said. “At the workshops, we go through the basics of environmental monitoring and how simple it can be to capture data using BioCollect – then we go on a field trip to put it into practise. 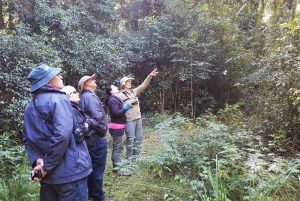 At the Killarney workshop we spent about 40 minutes in the rainforest looking at fungi, trees, snakes, birds, ferns, then created our own public citizen science project to conduct our biodiversity survey to demonstrate how to use BioCollect,” Natasha explained. Since the workshop, three citizen science projects have been set up by participants, one to monitor birds in Killarney and the other two to monitor biodiversity on nature refuges. Condamine Alliance workshop participants on a field walk through the rainforest on a nature refuge near Killarney, Queensland. “The Condamine Alliance team works hard to communicate that healthy environments translate into healthy communities and encourage the people in our catchment to play an active role in managing their natural resources,” said Natasha. This project is supported by Condamine Alliance through funding from the Queensland Government’s Queensland Regional Natural Resource Management Investment Program. Stay up-to-date with the Condamine Alliance via the Condamine Alliance facebook page. For more information on the Condamine Alliance workshops, contact Natasha Mylonas. For more information about BioCollect, contact ALA Team Leader, Peter Brenton.